ASAP Checks has got your business covered. We offer all 3 types of checks for QuickBooks: Voucher Checks, Standard 3-Per-Page Checks, and Wallet 3-Per-Page Checks. Our QuickBooks compatible checks are ready to ship in just 1 day, and we will beat any price! They're suitable for all ink/inkjet and laser printers. They're guaranteed to be compatible with the checks you order from your bank, accounting software company (Intuit), or check printer (such as Deluxe and Harland Clarke). If you find this isn't the case, you'll receive a full refund. You can view a complete list of security features on our QuickBooks checks by clicking here. Ordering checks for QuickBooks couldn't be easier with our secure website backed by the outstanding customer service from ASAP Checks. And if you're re-ordering QuickBooks checks, we have made it very quick and easy for you - click here to reorder. Ready to place your QuickBooks Checks order? Just click the button below!. ASAP Checks is a great place to order cheap checks online! I had some difficulty using my phone to place an order. I did get it figured out. The price was right so the aggravation was worth it. I will reorder from ASAP hopefully it will be smoother! 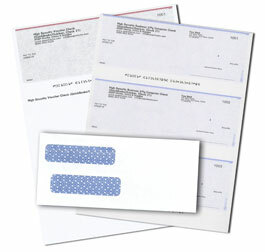 I've been a customer for several years and would never think of using another check provider. Your staff actually reviews the orders and on occasion have reached out to ask if what I ordered is really what I intended. Bravo.